Silver Lake's biggest debut of the year took us all a bit by surprise. The third collaboration between Vinny Dotolo/Jon Shook and Ludo Lefebvre, Trois Familia (am I the only one who thinks this place should've been called Trois Mex?) takes over the old home of Alegria On Sunset, which closed at the end of July after 22 years in business (apparently the owner wanted to retire). 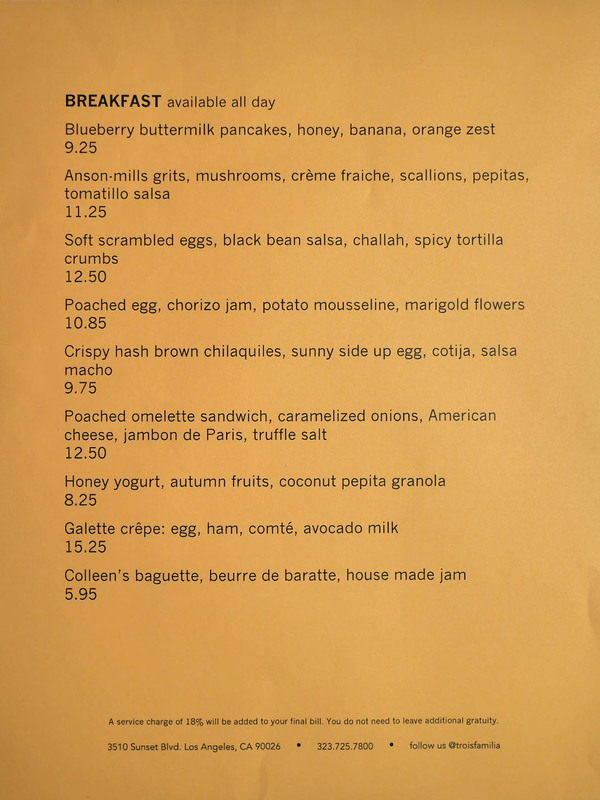 After a relatively quick turnaround, the restaurant soft-opened on October 27th, serving breakfast and lunch (a.k.a. 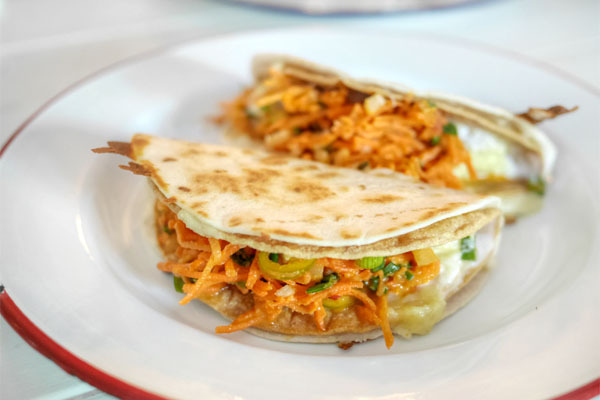 brunch) fare with a French-Mexican twist. 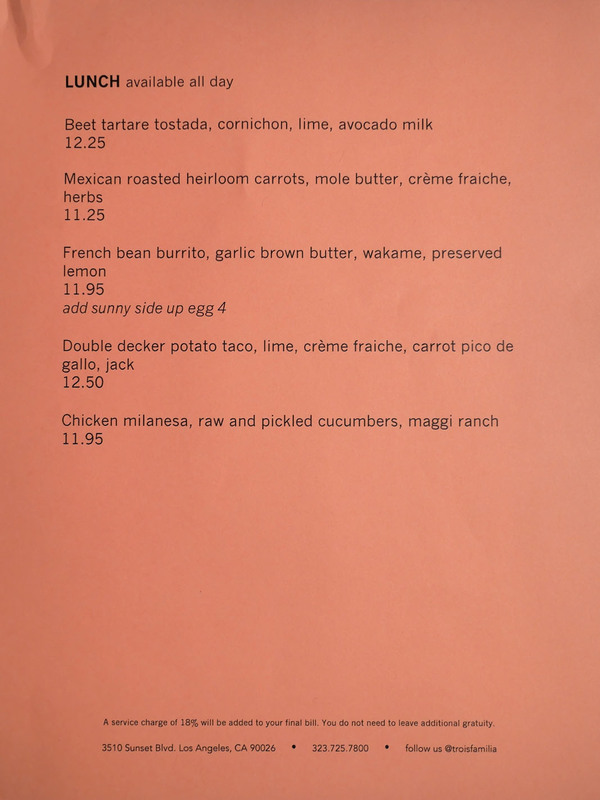 Trois Familia's menu is split cleanly between breakfast and lunch items, with the option of dessert as well. 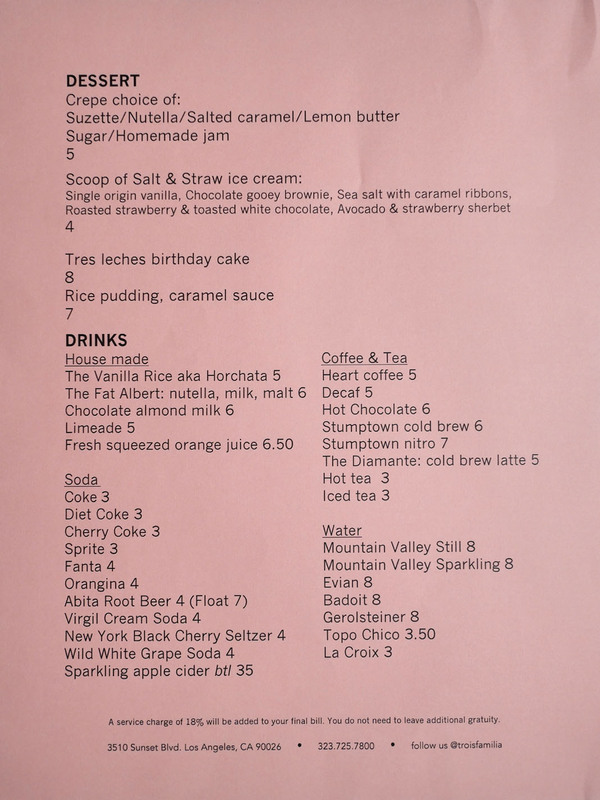 To imbibe: no booze, but instead some interesting sodas, coffee, and housemade beverages. Click for larger versions. 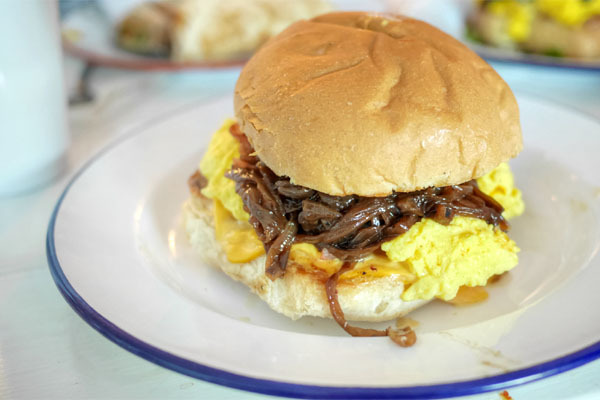 We opted to dive into the breakfast section first, and things started off strong. 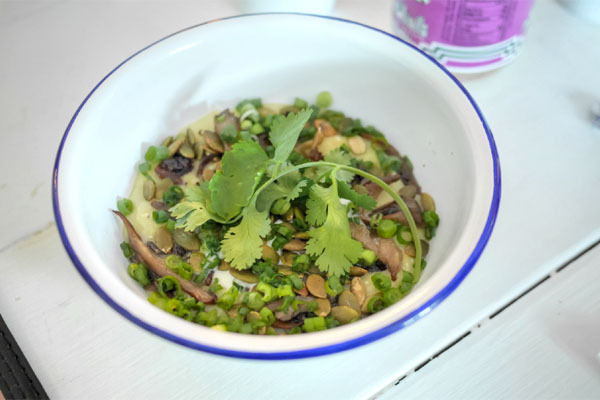 Grits were creamy yet coarse, a perfect base on which mushrooms, pepitas, and the various greenery could really mesh. You just want to keep eating spoonfuls of the stuff. An open-faced crêpe of sorts was lovely. 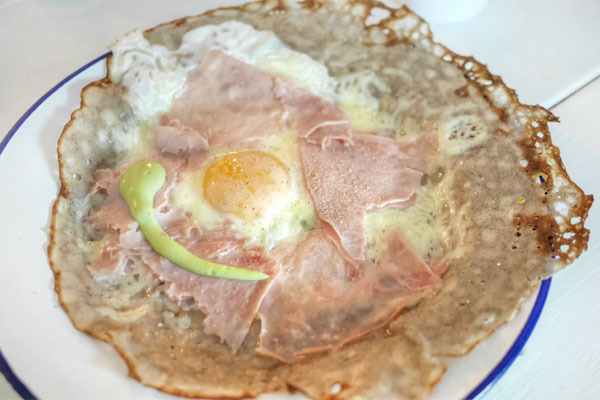 Excellent interaction between egg and ham, and I was a big fan of the soft, slightly crisp pancake as well. A couple of the homemade drinks. 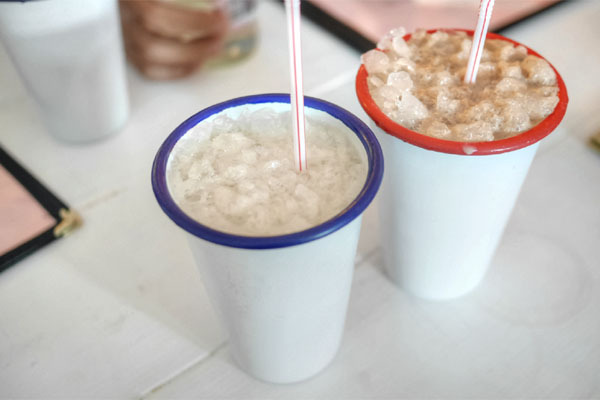 The Vanilla Rice aka Horchata [$5] was thick, viscous, with boatloads of sweet spice over floral, ricey notes. The Fat Albert: nutella, milk, malt [$6], meanwhile, was just as intense: massively nutty and sweet and malty, tasting almost of chocolate milk. 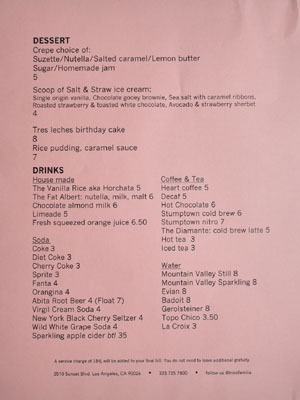 Now here was a throwback, something that I was served over five years ago at the opening night of LudoBites 5.0. It incorporated spot prawns back then, which had been removed by the time that v5.0 ended, and the dish even made a reappearance at the final LudoBites. This afternoon, it was as tasty as ever, the smooth, creamy potato tarted up by the salty-spicy sausage while a runny egg imparted an enveloping richness to it all. I have a hard time not ordering chilaquiles on a menu, and today was no exception. This was the most unconventional version I've had, but also one of the best. 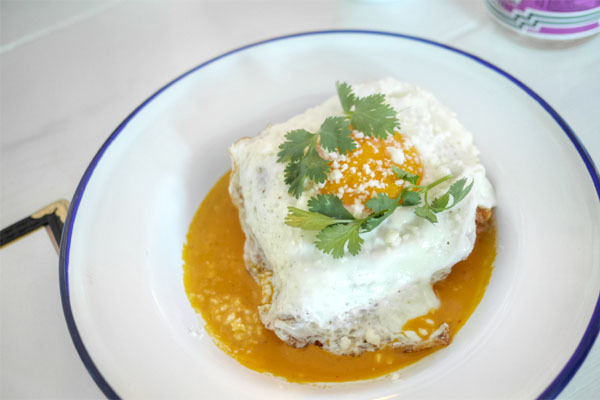 I loved the crunchy, savory hash browns and how they melded with the egg, but the crux was that salsa, which was simultaneously sweet, sour, spicy--a perfect accent piece. A take on Taco Bell's Double Decker was another highlight. That mix of cheese and potato was gratifying to say the least, and I was pretty enamored with the brightness of the carrot pico too. 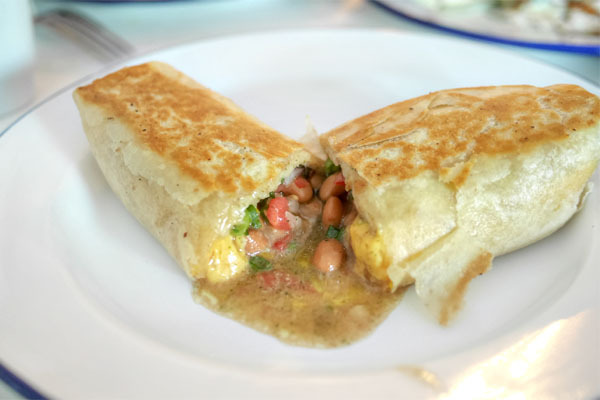 Combined with the sheer crunchiness of it all, you get probably the best papas taco that I've ever had. 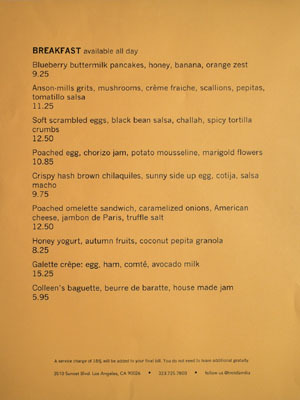 As we saw over at Petit Trois, the guys are capable of a mean omelet. That was apparent here as well, with the egg coming out super fluffy, super light, its delicate flavors amped up by shards of salty ham and a generous helping of sugary onion. 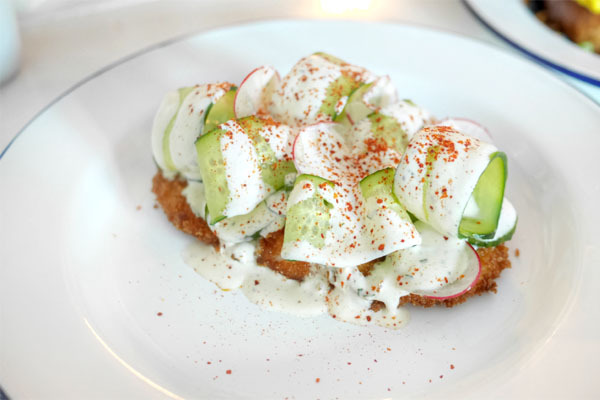 The chicken cutlet came out properly crisp, enriched by the creamy Maggi-laced dressing while slivers of cucumber gave things a cool crunch. Nice bit of heat on the back end, too. 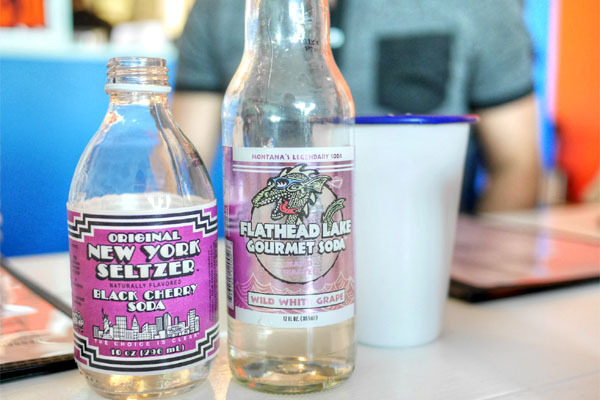 Next to drink came two sodas, the surprisingly in-your-face New York Black Cherry Seltzer [$4] and the somewhat more subdued Wild White Grape Soda [$4]. 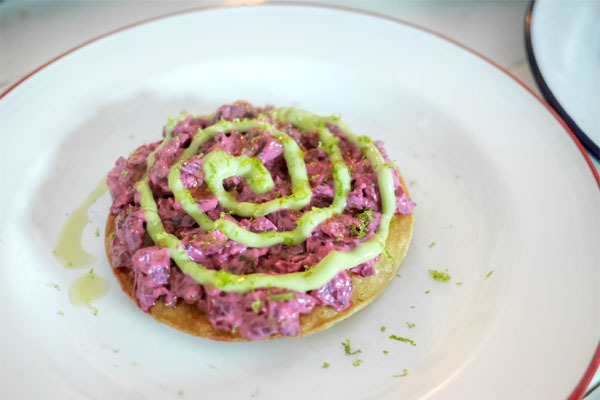 The tartar was the daintiest dish of the meal. The earthy sweetness of beet was definitely conveyed, but fortunately offset by the tartness of the lime-cornichon combo. 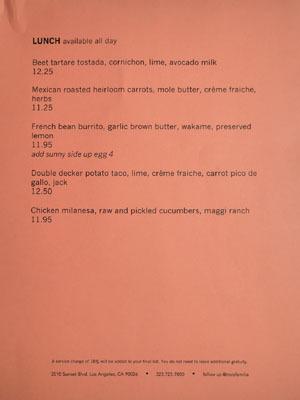 Great crunch from the tostada as well. 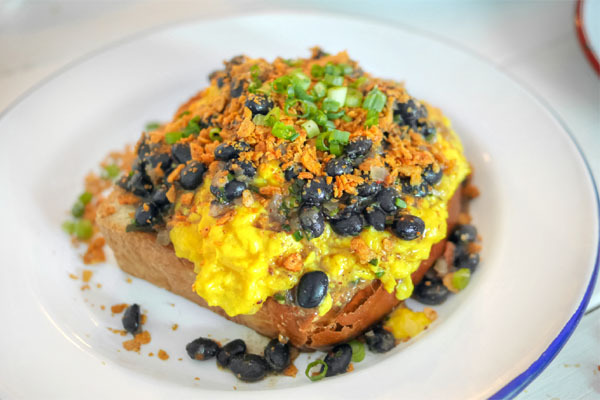 Eggs were again done justice, arriving soft, slippery, slightly herby, and well-matched to the hearty black beans. My favorite part? Those wonderfully crunchy, savory bits up top. We ended the savories with another standout. The garlicky brown butter worked wonders with the beans, giving them a richness and depth that paired swimmingly with the lemon and seaweed. Nice texture on the actual tortilla here, too. 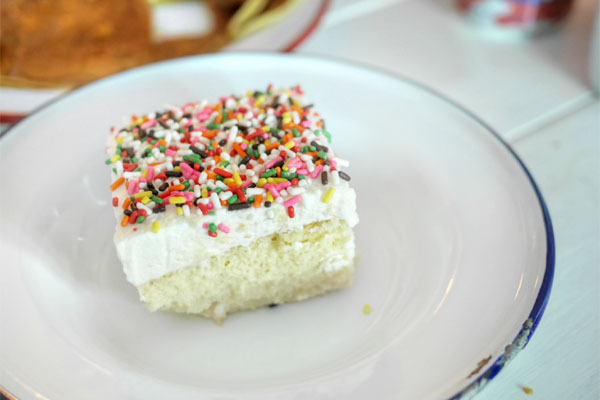 The tres leches was just what you'd want: dense, sugary, saturated, with the sprinkles adding just the right amount of nostalgia. I did miss the candle though. 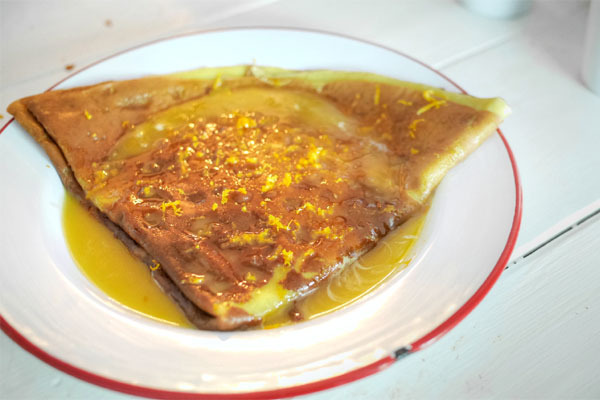 We closed with the iconic crêpe Suzette, one that really showed off the tangy, citrusy zip of beurre Suzette over a backdrop of springy pancake. Not surprising given the pedigree, Trois Familia looks to be another win from Ludo and the Dudes, with perhaps a bit less influence from the former compared to their preceding two projects. 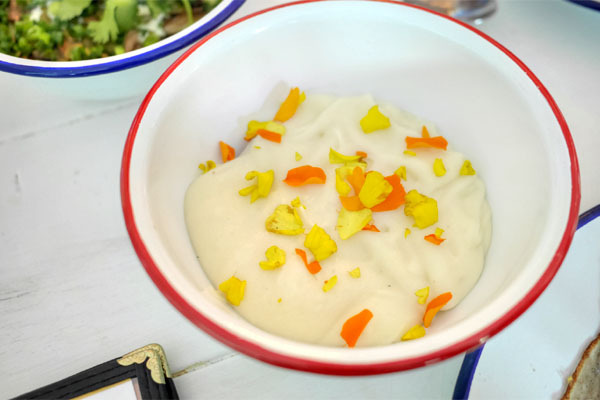 I will say that this was some of the most intriguing, beguiling brunch food that I've encountered, classic at one level, but loaded with the sort of cheffy/irreverent twists that you'd expect from the proprietors. Another score for Silver Lake.